Eli Manning expects the New York Giants to take a quarterback in this year's NFL draft (Image: GETTY)Manning, who is entering the twilight years of his career, understands the Giants need to look towards the future but is still adamant he has a job to do next season.The 38-year-old, who is a two-time Super Bowl MVP, made his comments as Ohio State quarterback Dwayne Haskins was visiting the Giants’ facility as New York began their offseason workout program. "Yeah, I figure the Giants are going to get a young quarterback. So I understand that," Manning said. "I still have to do my job, and I'll do my part. 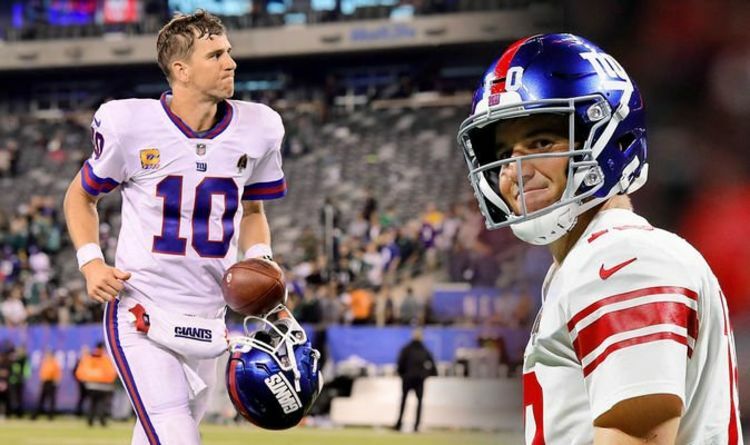 Related articles Giants GM issued Eli Manning warning by NFL expert 2019 NFL Draft: Key reason why Giants should pick Dwayne Haskins I figure the Giants are going to get a young quarterbackEli Manning“And my job as I see it is to go out there and play quarterback and win football games. “That is what I'll do. "The Giants struggled last year. They lost three consecutive games to see out the regular season as they finished bottom of the NFC East with a 5-11 record.Manning, who is entering the final year of his deal this season, came in for criticism during that campaign, most notably from former Giants superstar wide receiver Odell Beckham Jr. The Giants struggled last year as they finished bottom of the NFC East with a 5-11 record (Image: GETTY)Last season Eli Manning threw for 4,299 yaEi Mards, 21 touchdowns and 11 interceptions (Image: GETTY)He threw for 4,299 yards, 21 touchdowns and 11 interceptions. Manning was also sacked for a career-high 47 times. After the end of the season Manning informed the Giants of his intentions for the 2019 season.“I knew pretty quickly I still wanted to play,” Manning said.“I told the Giants very quickly. I didn’t have to think about it long. This is what I know, this is what I like to do and what I work extremely hard at doing. “I’m excited for it. I like kinda the way the team rallied at the end of the year and started playing better football and I think came together with the coaches.“Still could have won a few more of those games. I think we’re headed in the right direction.”As for who New York will draft, head coach Pat Shurmur revealed the team intended to have all the top quarterbacks visit the organisation. The Giants have the sixth and 17th picks in the first round of the draft and so have scope to take a quarterback or trade up if they feel the value is there. Related articles Saquon Barkley: Giants star issued TROUBLING warning over Eli Manning Giants star Saquon Barkley reveals WHY he is a fan of Colin Kaepernick Pat Shurmur revealed the Giants intend to have all the top quarterbacks visit ahead of the draft (Image: GETTY)"I would like to come out of this draft with a quarterback, but here is the thing: Show me what the grades are," Giants co-owner John Mara said.